You might wonder, with all the needs in Haiti, why support the soccer initiative? It may sound odd to focus on sports when meeting basic nutritional needs is a struggle, but this program follows our strategy of encouraging integral health and education programs. Starting an outdoor soccer program in Latiboliere is a logical choice because soccer can be played year round and set up costs are minimal. Our program is new but building momentum. In Latiboliere, just say the word "football" to the children and smiles instantly appear! Children love to play soccer, but due to economic circumstance often play in their bare feet. Without adequate equipment, the risk of injury is great, while the opportunity for even basic healthcare is scarce. 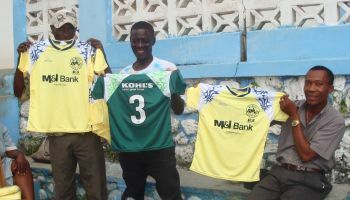 To add joy to the lives of those much less fortunate by providing basic soccer gear accompanied by a structured program. 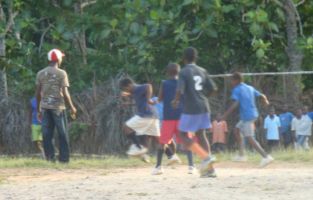 The Haiti Soccer Initiative working with the Sports Committee of Latiboliere teaches soccer and promotes teamwork, fair play, reinforces family values and strengthens community ties. It scores dividends for families and the community. Needed education is also provided on personal hygiene, public health, and sound personal decision making. Funds are needed to improve field conditions, build a fence and purchase goal posts. Fields are rocky, uneven, and dangerous. Goal posts are made of wood and need to be replaced often. The fence is made of dried sugar cane plants, which is routinely eaten by goats. Gift Cards to Sports Authority or other local Soccer Shops. If you have a passion for soccer, are comfortable approaching individuals and asking for donations or are skilled at planning special events help us reach our goal by joining the Haiti Soccer Committee. Don't you realize that your body is the temple of the Holy Spirit, who lives in you and was given to you by God? You do not belong to yourself, for God bought you with a high price. So you must honor God with your body.